Following D&T’s winter wedding ceremony at the Toulouse Mairie, here comes the reception! 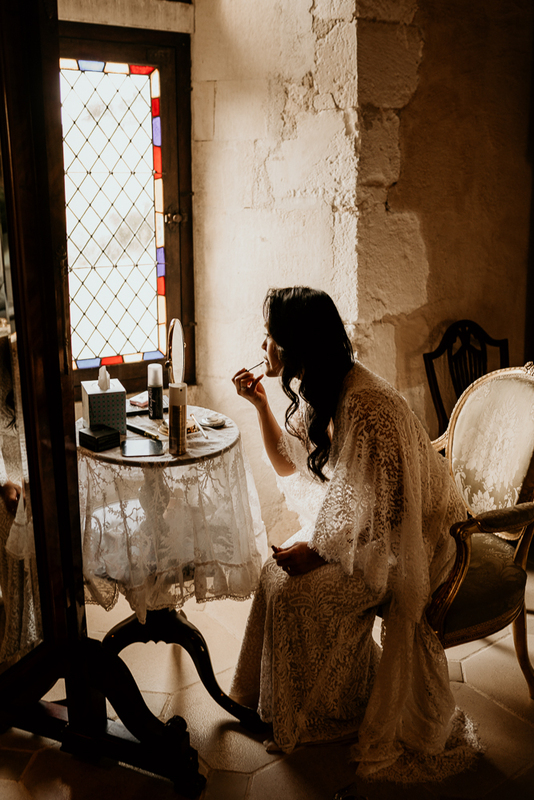 Waiting until late summer, they prepared a wonderful wedding at one of the most beautiful chateaus in SW France – Chateau de Brametourte, coordinated by wedding planner Gill Spencer. Chateau de Brametourte, fully reconstructed from a ruin, now makes a stunning wedding venue and hotel. It’s new owners, Alison and Paul, did a wonderful job and gave it a new life. I love how they reconstructed it keeping its traditional style and ancient character, with huge attention to details, and all in a sustainable way. I loved exploring its many rooms and admired the breathtaking views. 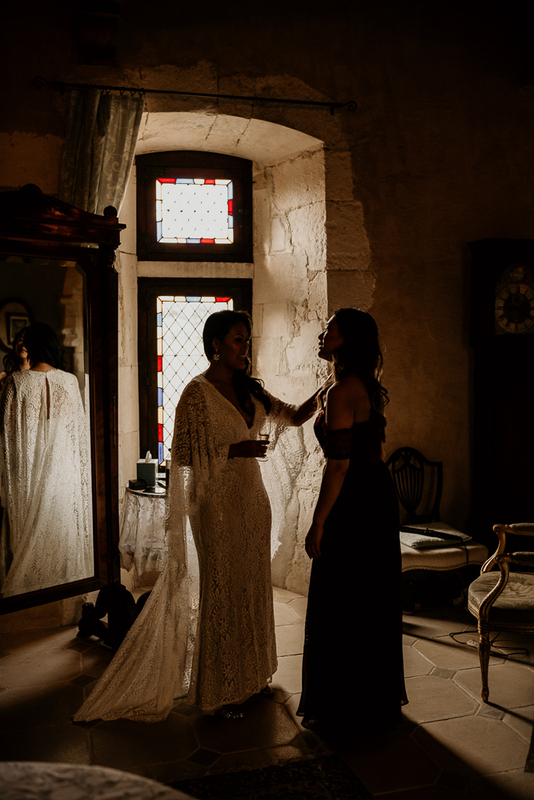 After a very long search, Dani finally found the one – a beautiful bohemian-style wedding dress from JJs House – perfectly suiting her free spirit and glamorous look. Statement earrings and sparkling heels from Blue by Betsey Johnson Stela made a great addition to the stylish bridal look. The look was finished with a seasonal flower bouquet from Lillith Curiosa. Having done her own hair and make up, she looked absolutely gorgeous and was glowing of happiness. Thomas opted for a stylish casual look, wearing a light brown jacket (Santaniello) with a pocket square (Pochette Square). 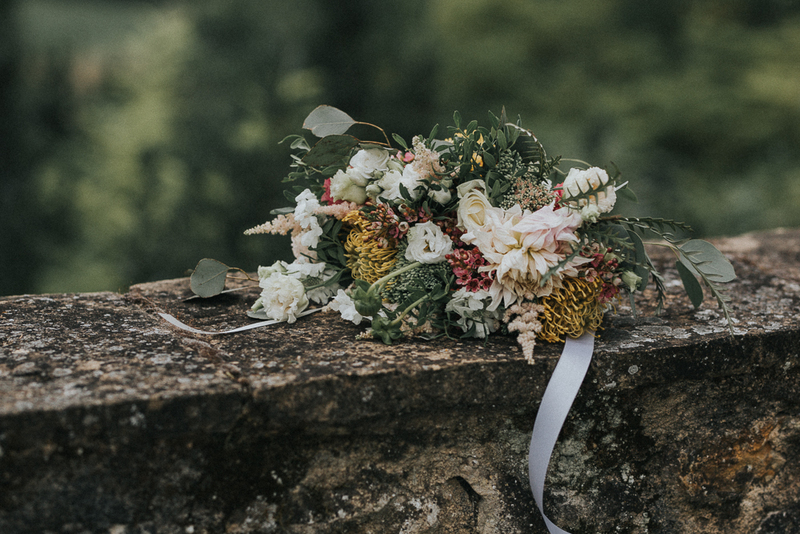 Having already had their wedding ceremony back in February, and another family wedding in Australia, they decided on a casual and relaxed wedding reception here at Chateau de Brametourte. 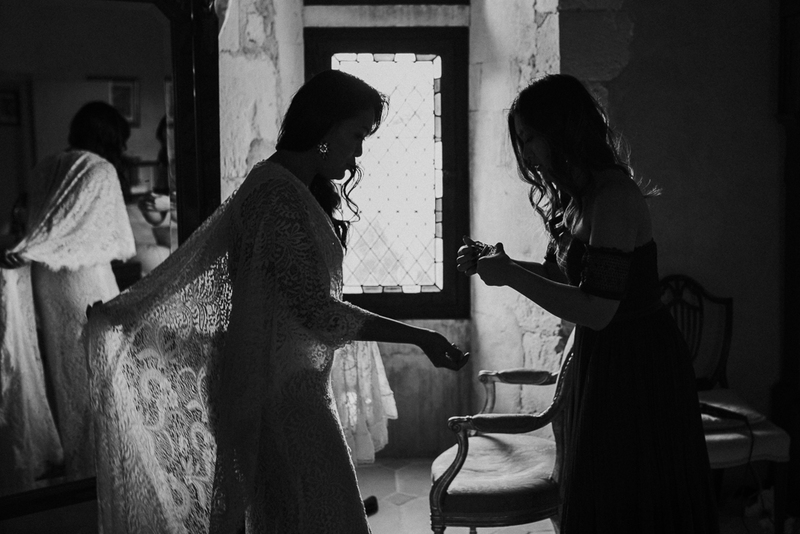 Instead of a traditional ceremony, they welcomed the guests with speeches, and champagne. The guests enjoyed the aperitif while a lovely jazz band Thibaud Dufoy Trio created a nice atmosphere. The evening reception took a place in a marquee by the swimming pool, with a wonderful view of the rolling hills. I love the rustic style and vintage elements. With the hay stacks for sitting on and seasonal foliage, the venue earned a relaxed and cosy character. The vintage ornaments and meadow flowers added an elegant statement to the decor. All gently illuminated by candles and fairy lights. For the reception, the bride changed into her dinner outfit, with a beautiful skirt from Lace Marry. Everyone was impressed by a great bbq dinner, prepared by Sandrine Elmoznino (from La nature dans l’assiette) and served in a form of a buffet. The beef skewers, prawns and a variety of salads were delicious, and grilled halloumi cheese was a special surprise. D&T had a wonderful wedding ceremony and fabulous receptions. We hope they can relax and enjoy the memories of these great events.